Jamie Foxx (White House Down) and Dane DeHaan (Chronicle) join the movie franchise in The Amazing Spider-Man 2. Foxx and DaHaan play villains Max Dillon/Electro and Harry Osborn/Green Goblin, respectively, a pair who make Spider-Man’s (Andrew Garfield, The Social Network) life very difficult as he tries to balance protecting his fellow New Yorkers and spending time with girlfriend Gwen (Emma Stone). Campbell Scott (Handsome Harry) and Sally Field (Lincoln) return as Peter Parker’s father and Aunt May, respectively, but the cast also welcomes Paul Giamatti (Barney’s Version) and Felicity Jones (The Invisible Woman). Directed by Marc Webb ((500) Days of Summer), who also helmed the first Spider-Man reboot, the PG-13 science-fiction film wasn’t quite received as warmly as the first by critics and moviegoers. 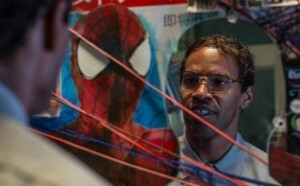 Although it didn’t beat The Amazing Spider-Man in box office grosses, 2 still brought in a tidy $199 million. “Spidey Gets His Groove Back: Music and Editing,” a behind-the-scenes look at jam sessions with composer Hans Zimmer and the film’s team of musicians, including Pharrell Williams, Johnny Marr and Michael Einziger. All three versions include a downloadable digital copy of the movie, and the DVD also has an exclusive new public service announcement from the Worldwide Orphans Foundation and Andrew Garfield.